Acupuncture, as the word suggests, punctures the skin with very thin, long needles. Acupuncture needles are flexible lengths of disposable, hypoallergenic, sterile metal that a trained acupuncturist delicately inserts beneath the skin, into muscle and tissue. When properly done, this shouldn't hurt at all. The needles reach certain areas, called pressure points, to break up the blockages. The benefits of acupuncture include increased circulation; decreased swelling and inflammation; relief from pain and muscle spasms; and increased T-cell count, which stimulates the immune system. While both acupuncture and acupressure both work to relieve pain, acupressure does not use needles. Rather, a therapist uses the hands to place pressure on one or several of the body's 14 meridian points. 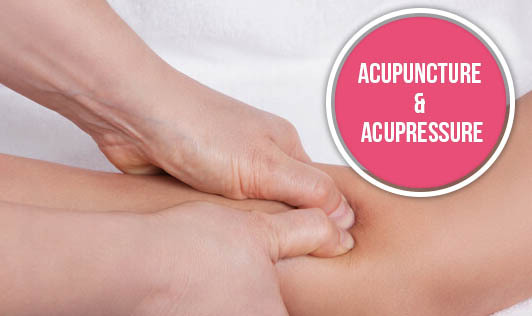 Acupressure can help relieve muscle tension and balances all of the body's forces. These two different methods of holistic medicine have a lot of similarities, as they are both based on touching contact points that carry energy, or chi, all through the body. Both are used to treat the same diseases.